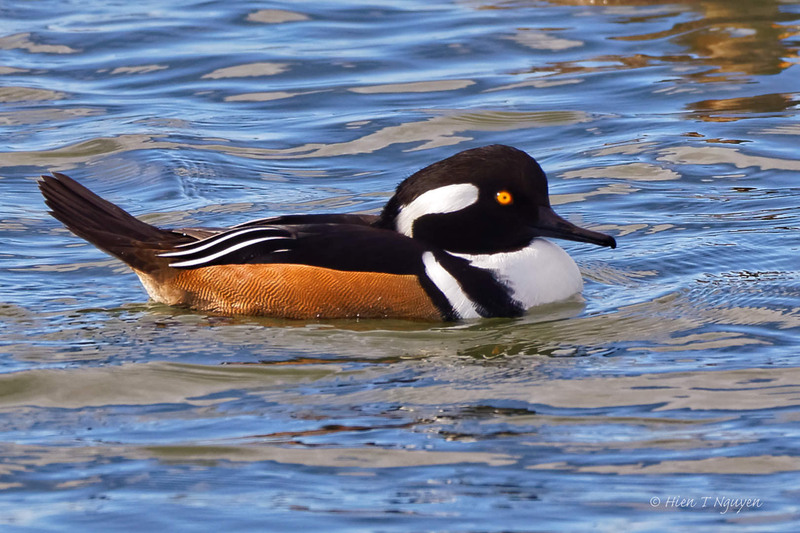 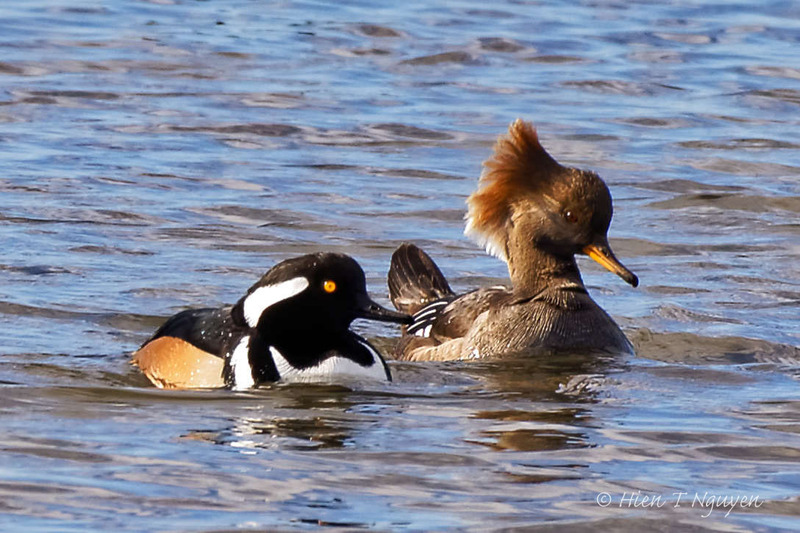 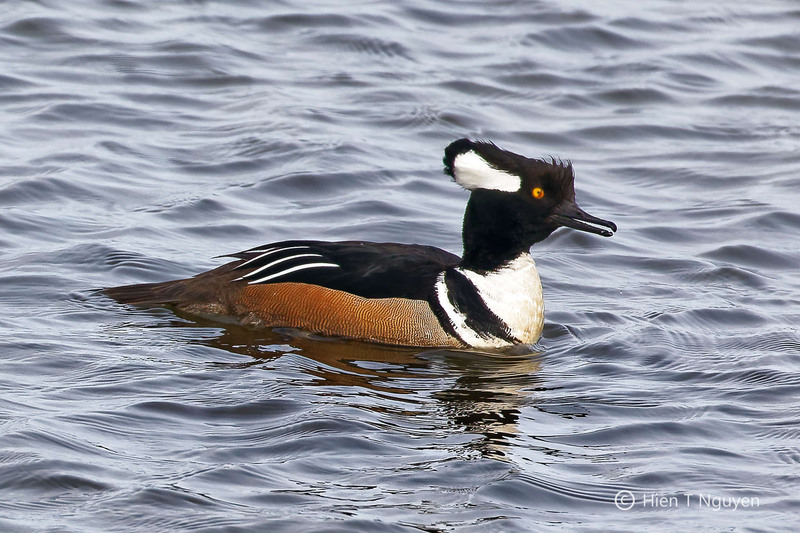 Hooded Mergansers are my favorite winter ducks. 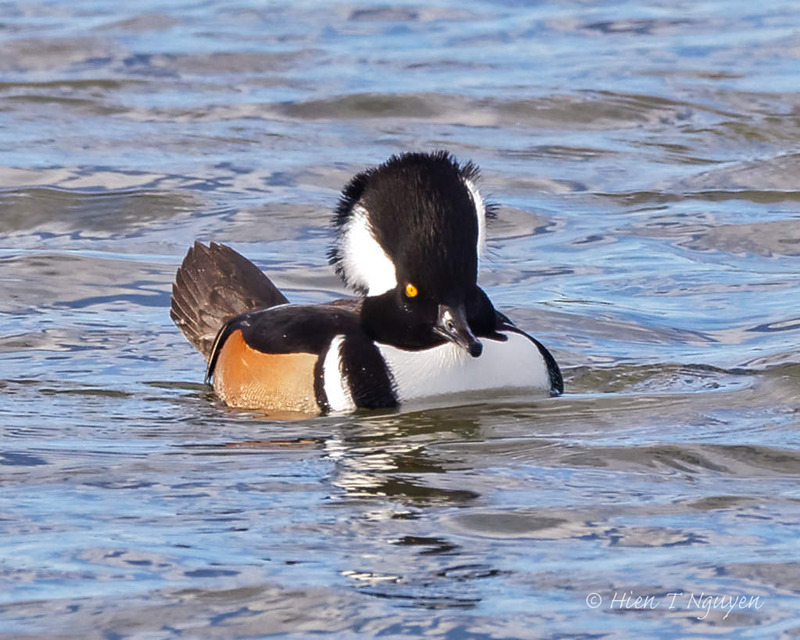 The males really look cute with their black and white hood, especially when they try to get a female’s attention, like the one below. 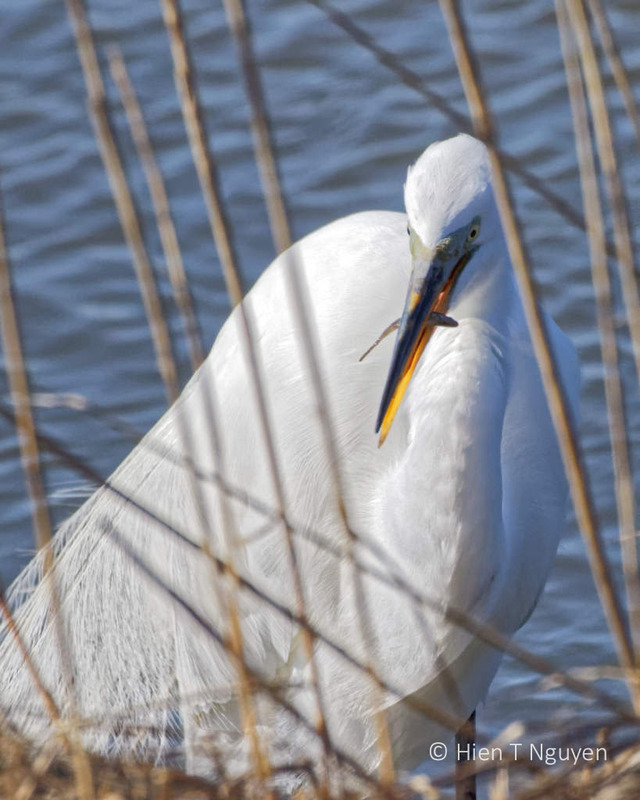 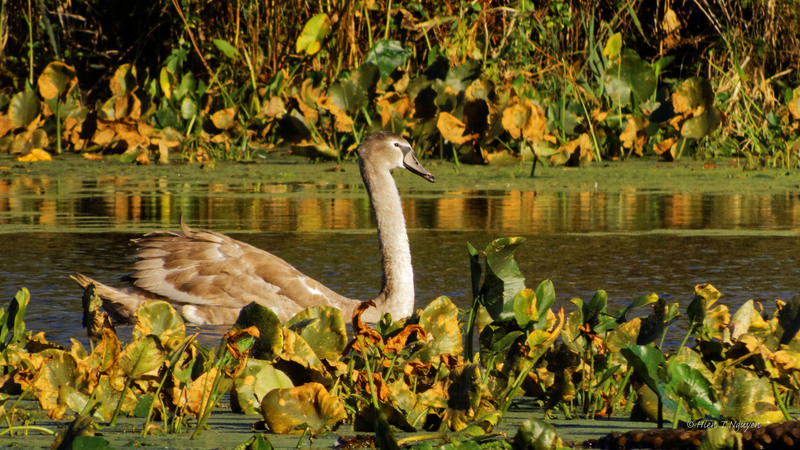 He was among many of its kind at the refuge yesterday. 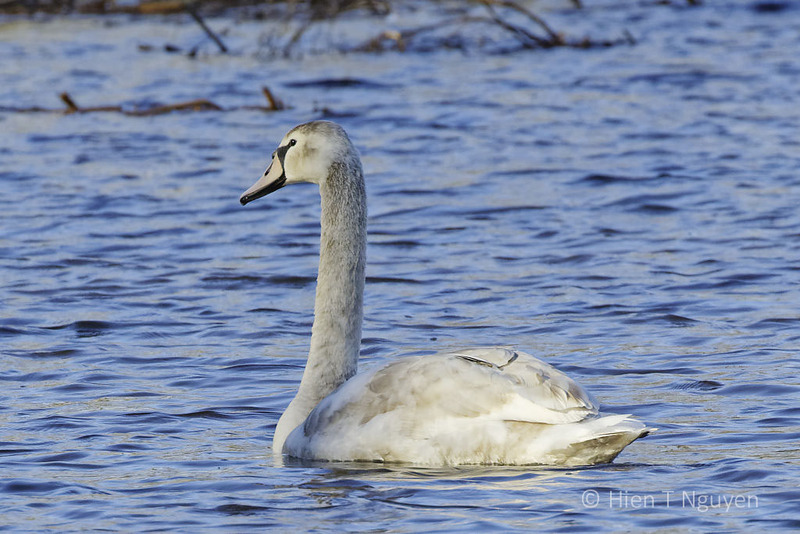 Meanwhile, a Mute Swan flew overhead, a rare sight for me. 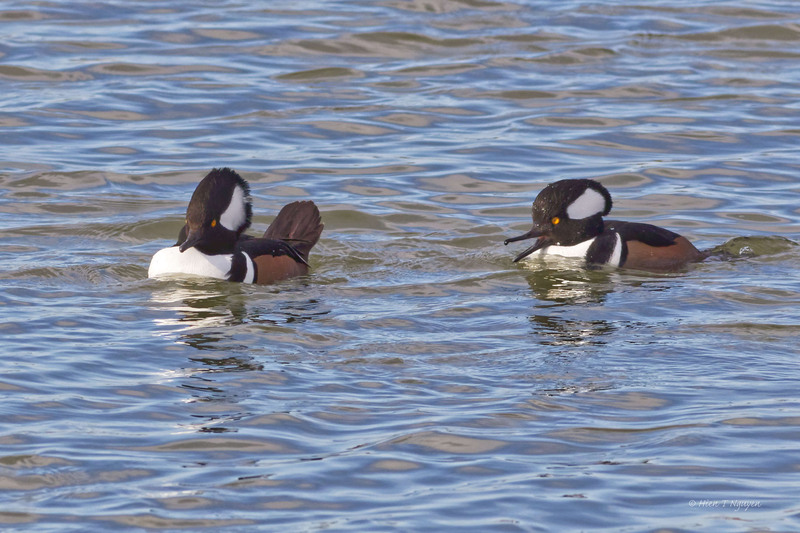 Hooded Mergansers. 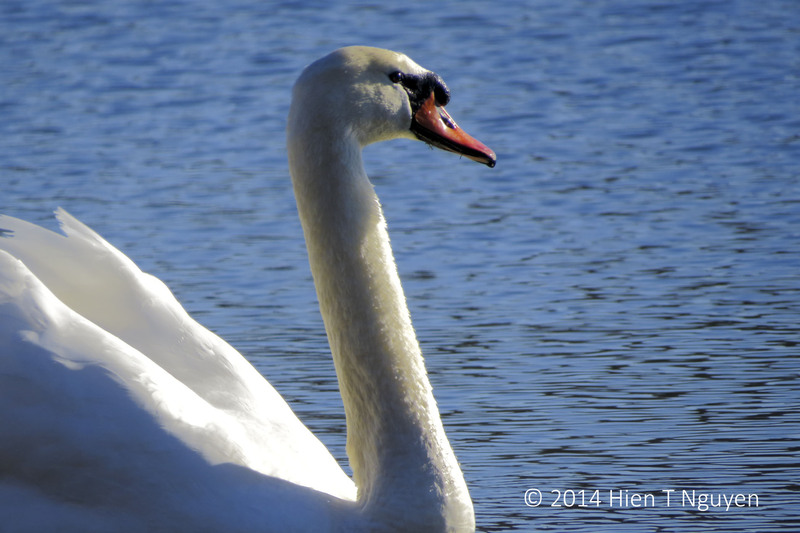 Was he looking up at the swan? 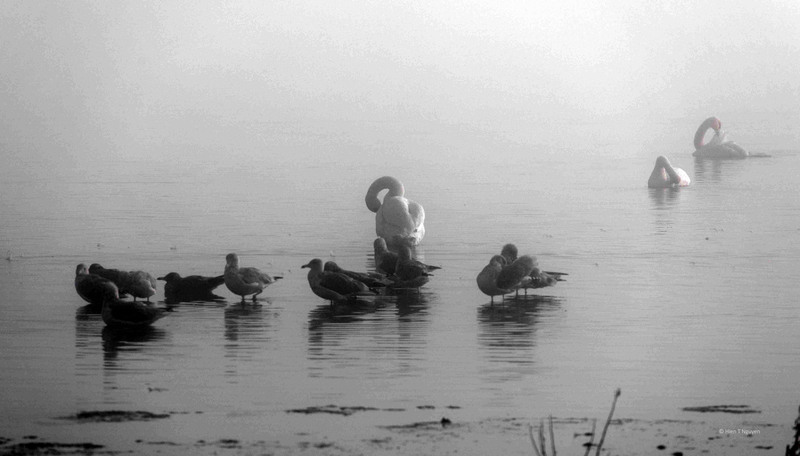 It was very foggy yesterday. 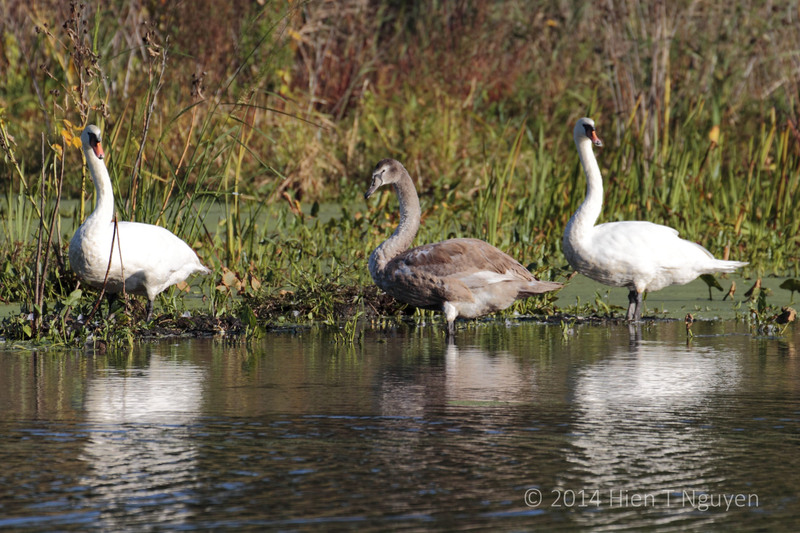 On my way to Edwin B Forsythe National Wildlife Refuge I could see no more than 100 ft (30 m) ahead, and twice almost ran into deer crosssing the road! 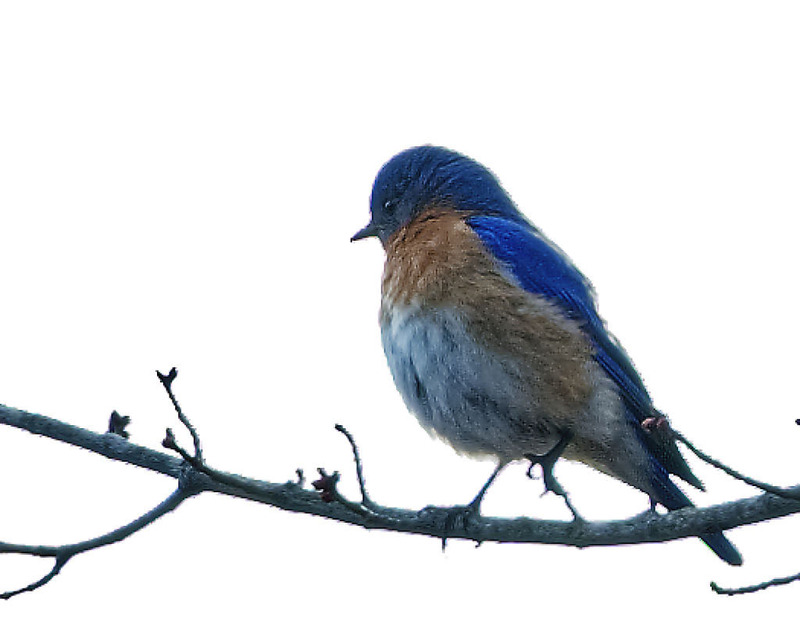 When I arrived at the refuge, the usual scenery looked very iffy in the thick fog, but I was not about to go back after a two-hour drive. 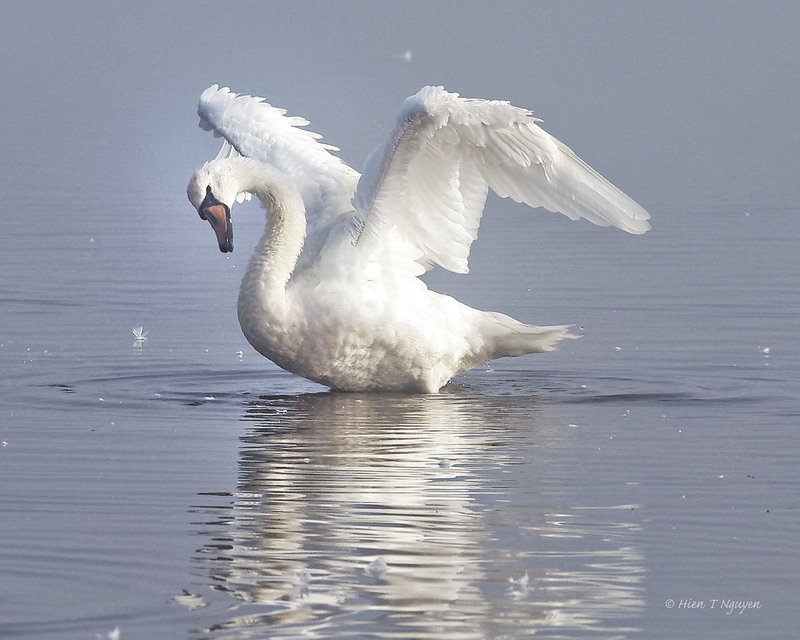 Slowly the fog lifted, and after half an hour, sunlight fell on beautiful swans and other birds swimming in the sweet water pond. 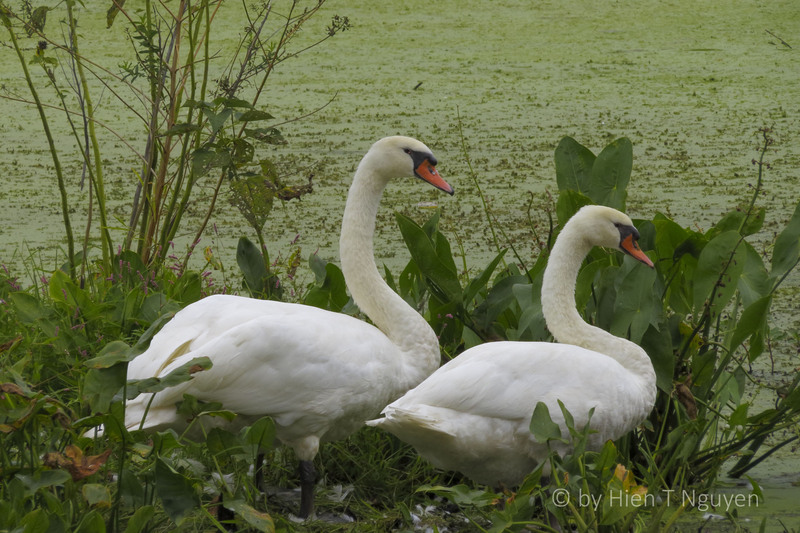 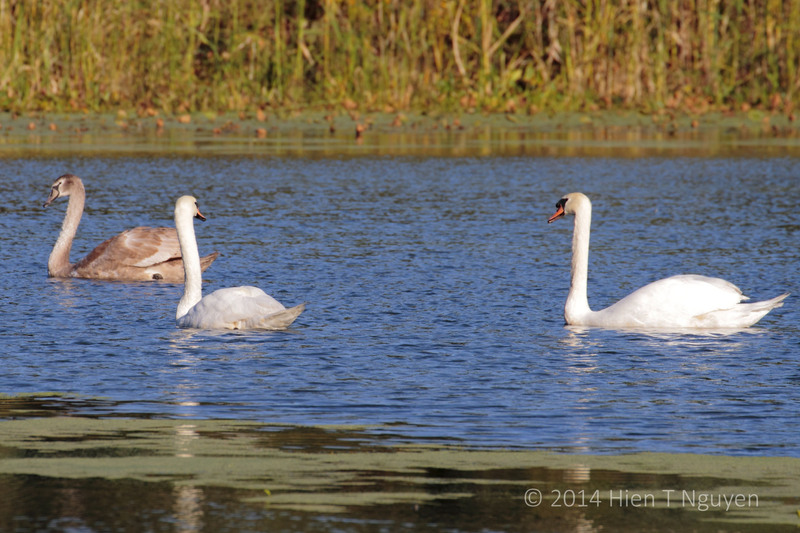 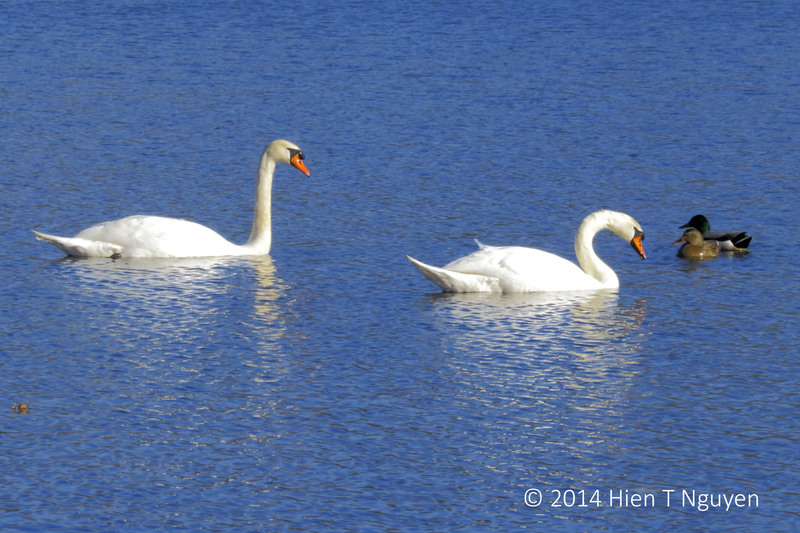 The swans were probably the same I photographed last week, but they had lost their juvenile colors and were all white. 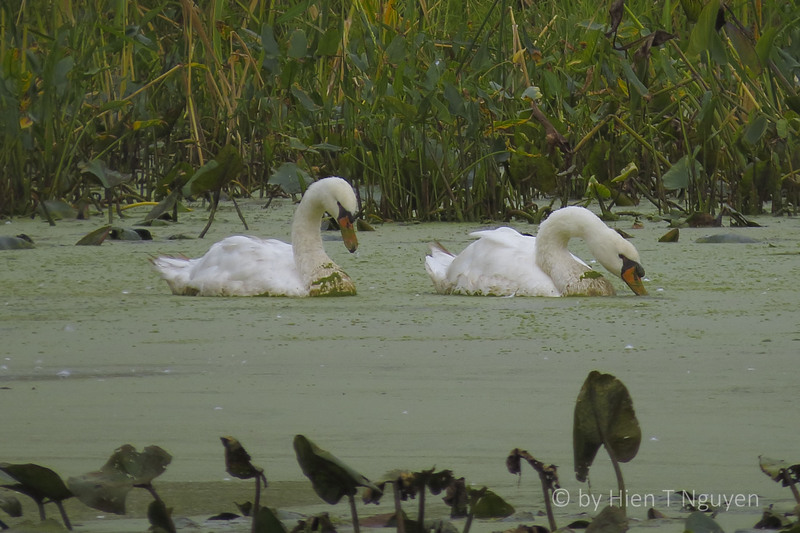 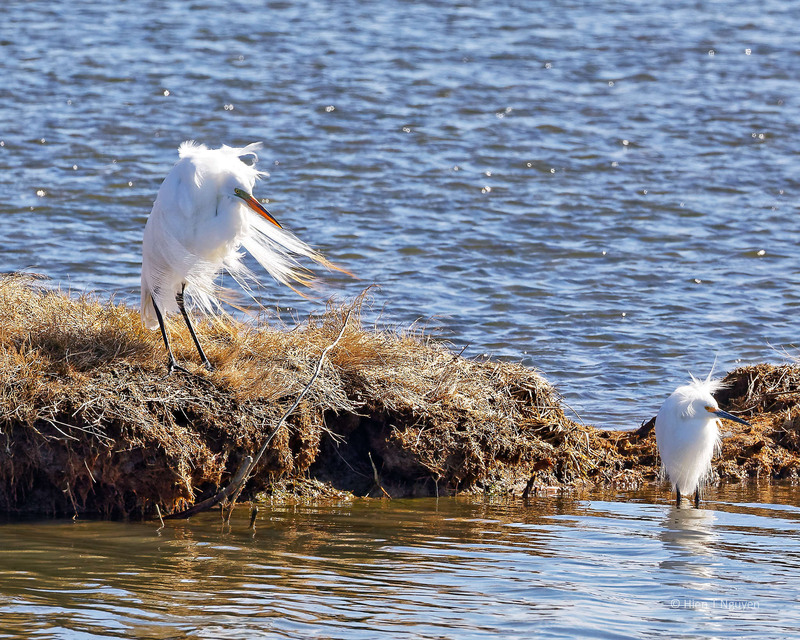 They had been preening and looked much cleaner than last week. 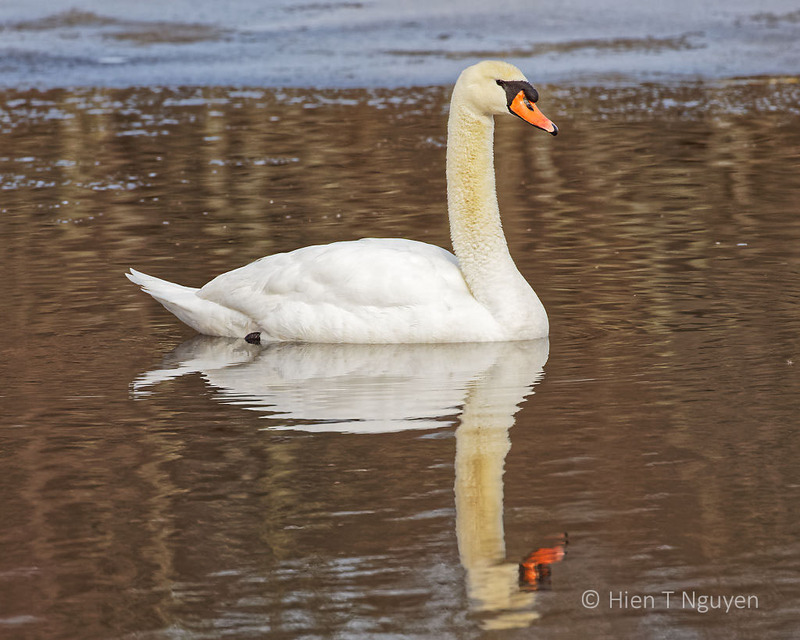 Mute Swan with Canada Geese in the background. 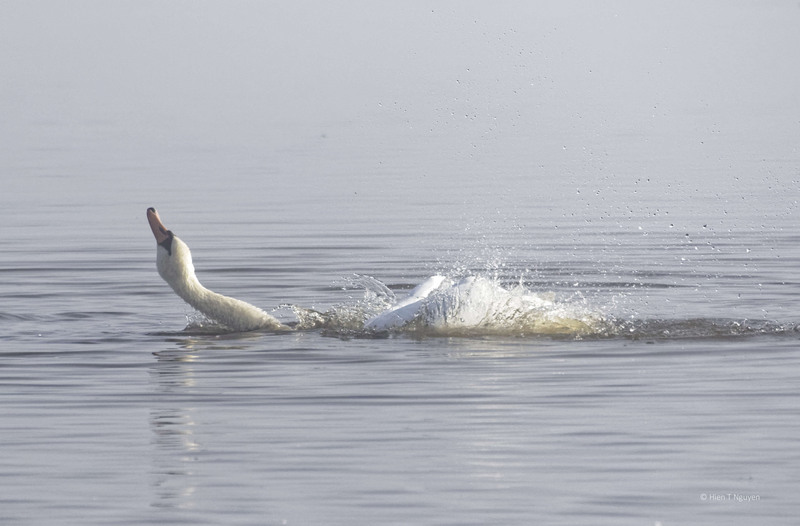 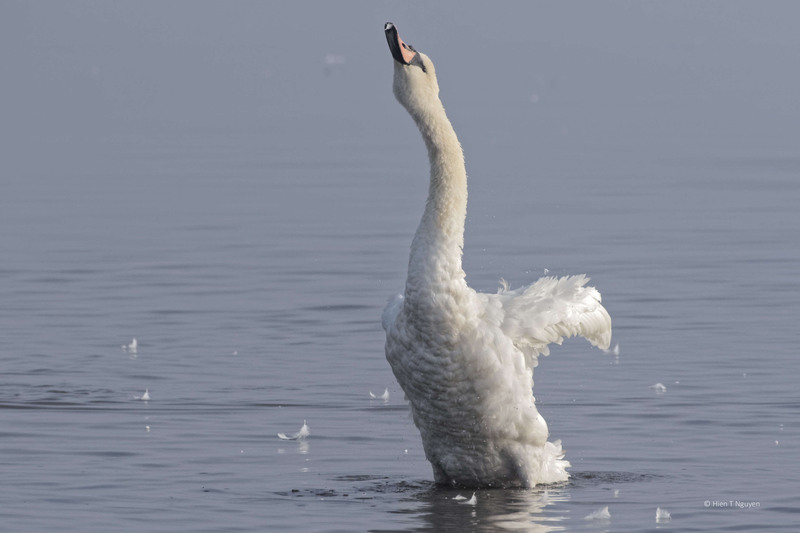 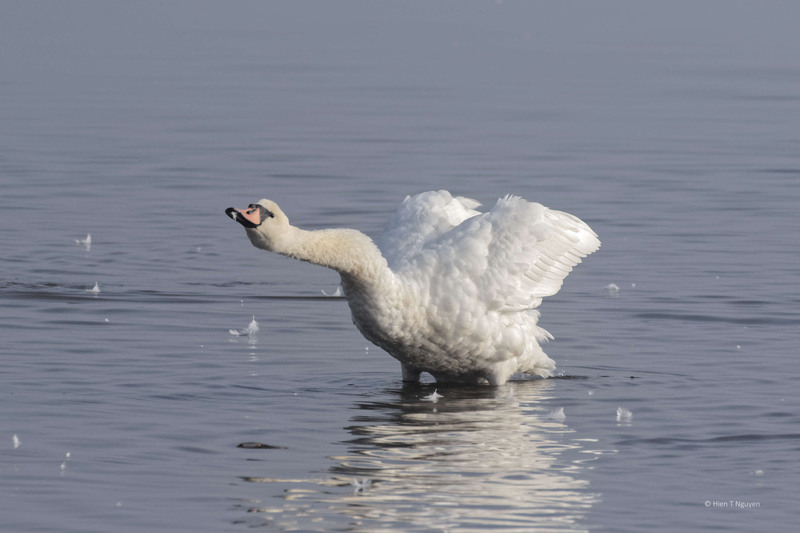 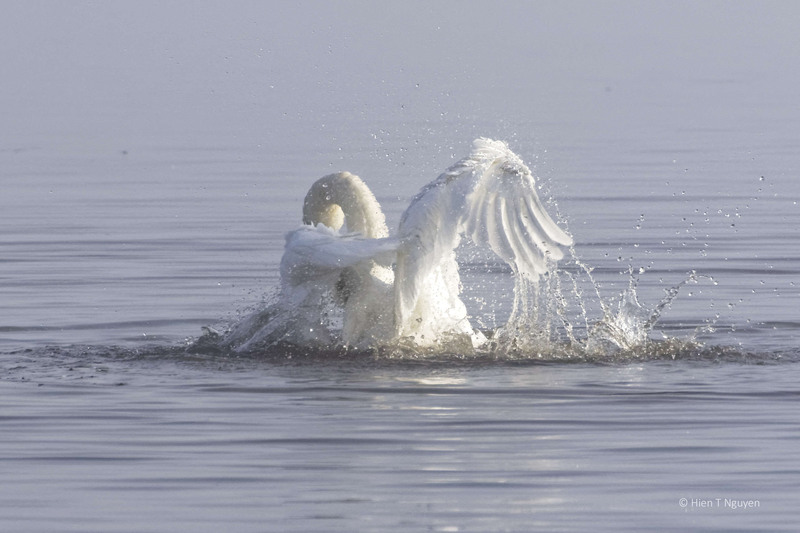 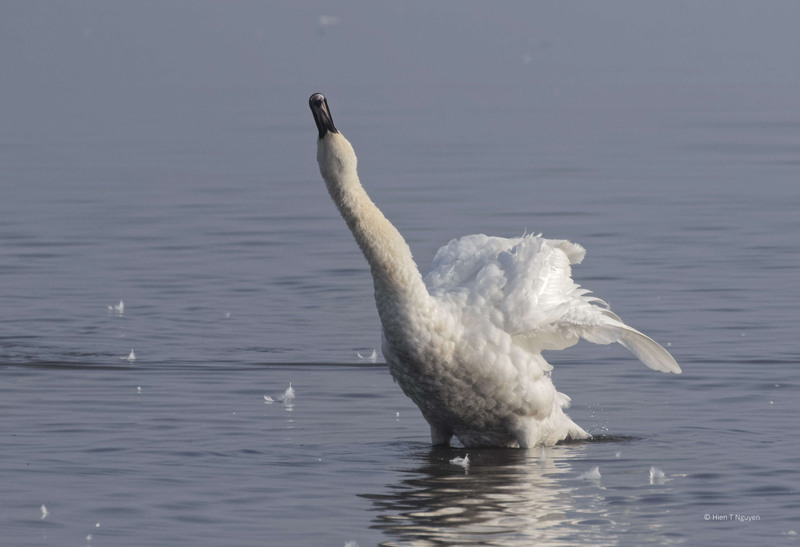 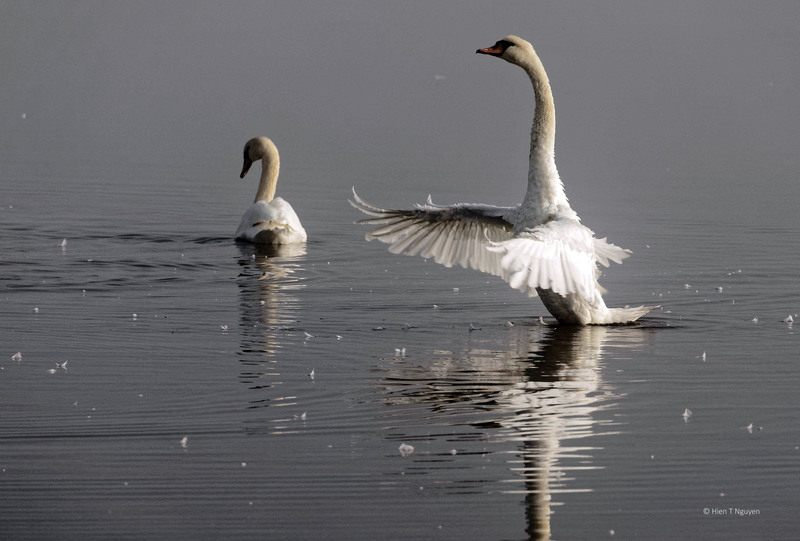 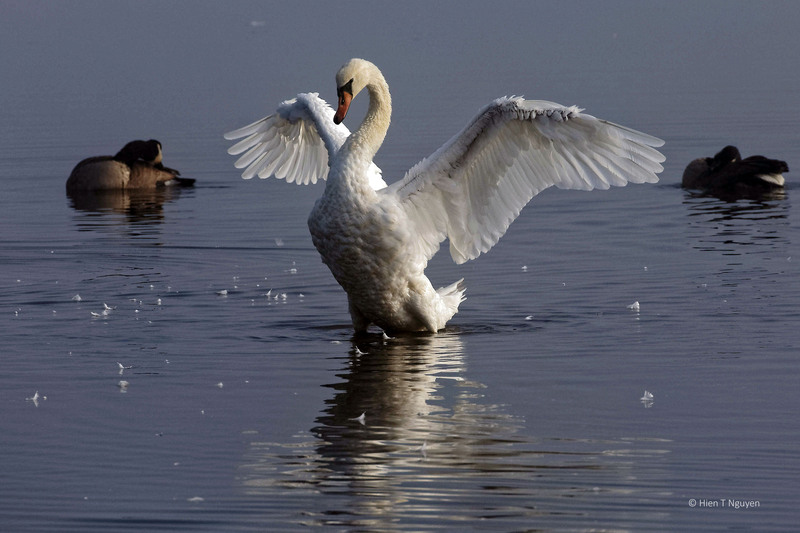 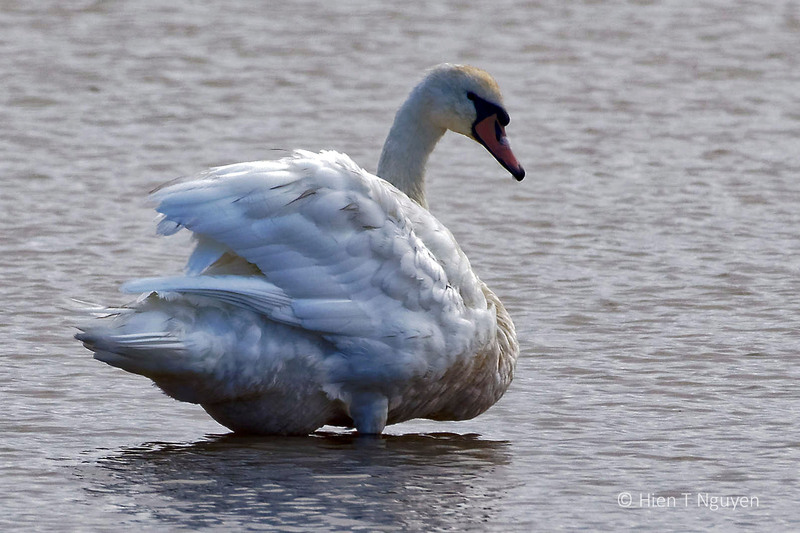 The following photos show a Mute Swan flapping its wings after it had finished preening and taken a dip in the water. 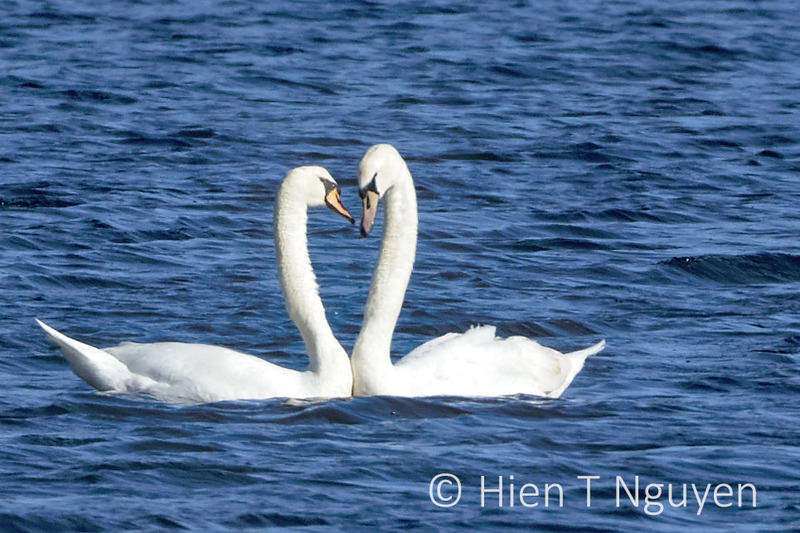 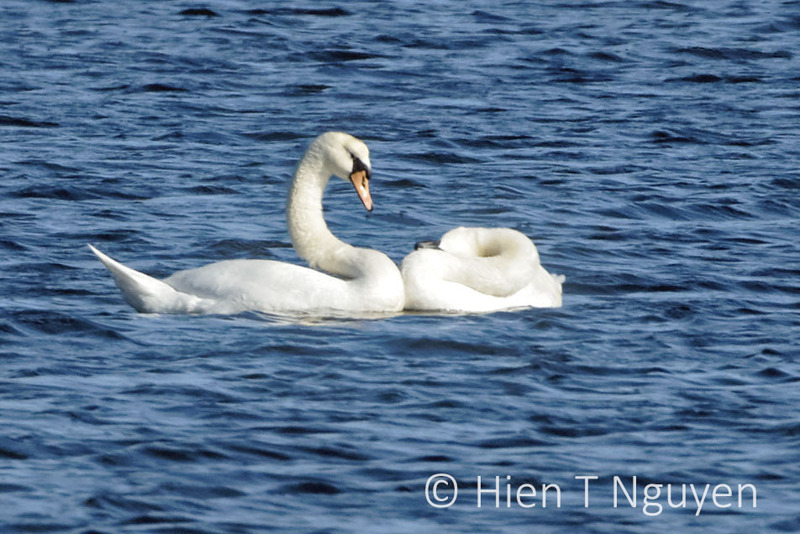 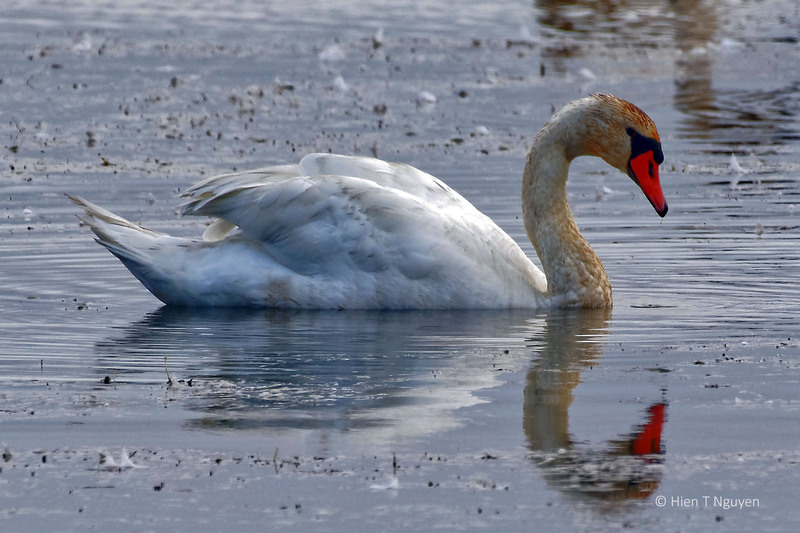 Mute Swans are monogamous and mate for life. 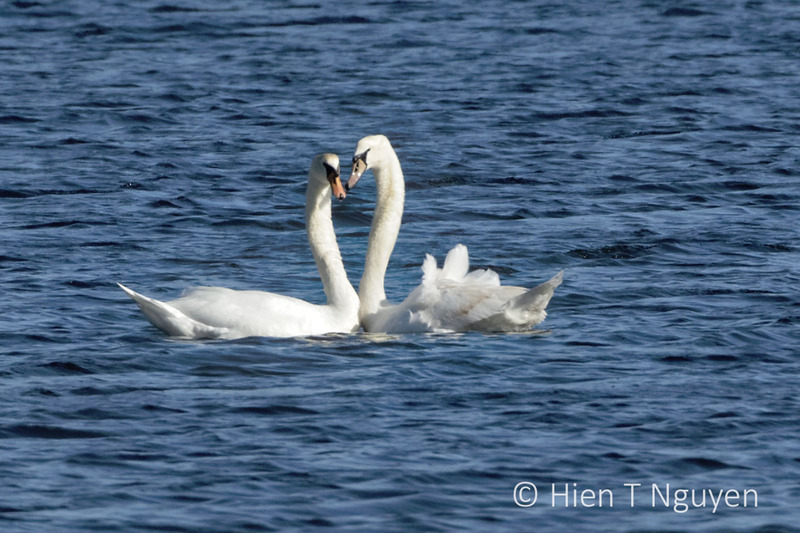 However, when one of a pair dies, the other will try to find another mate. 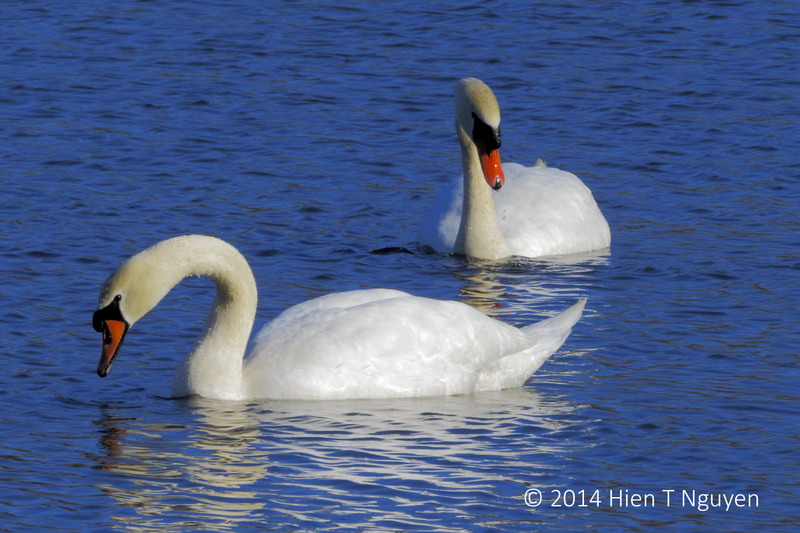 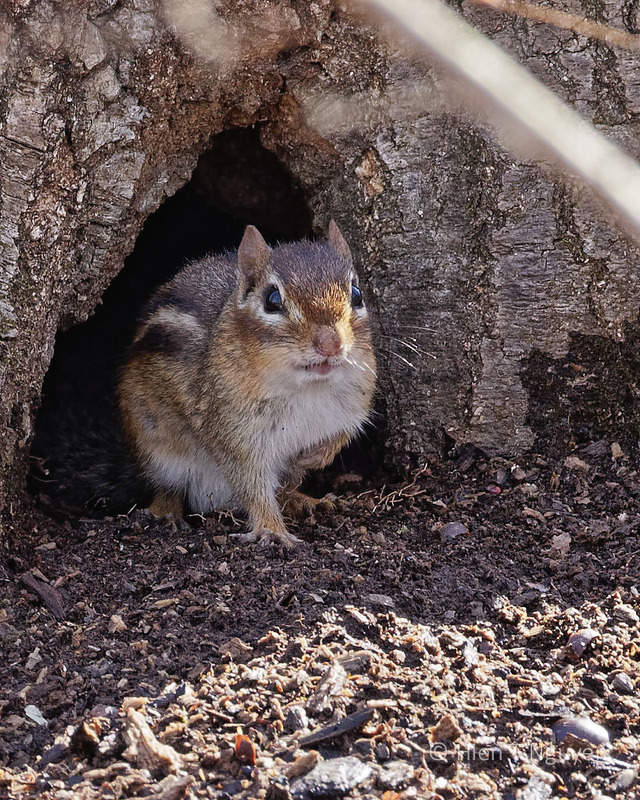 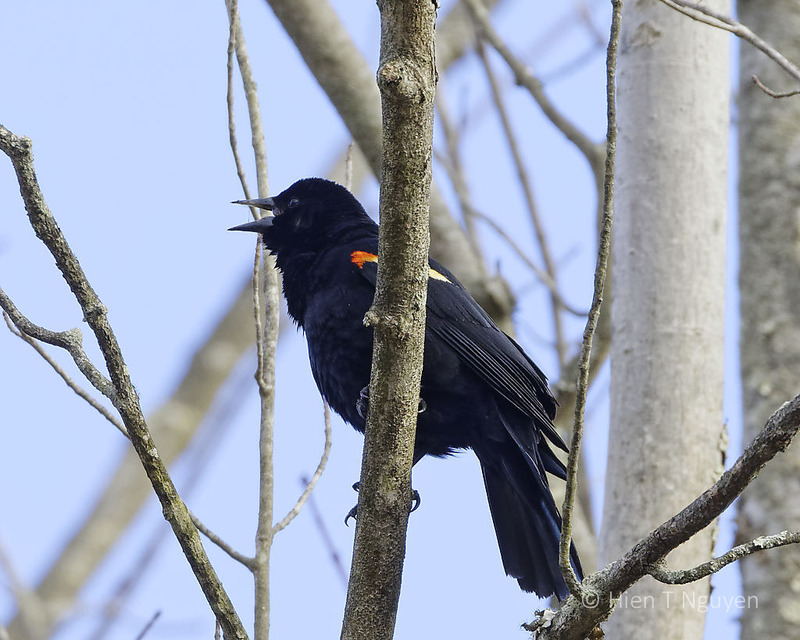 A male will then find a younger or older female, but a female will look for a younger male. 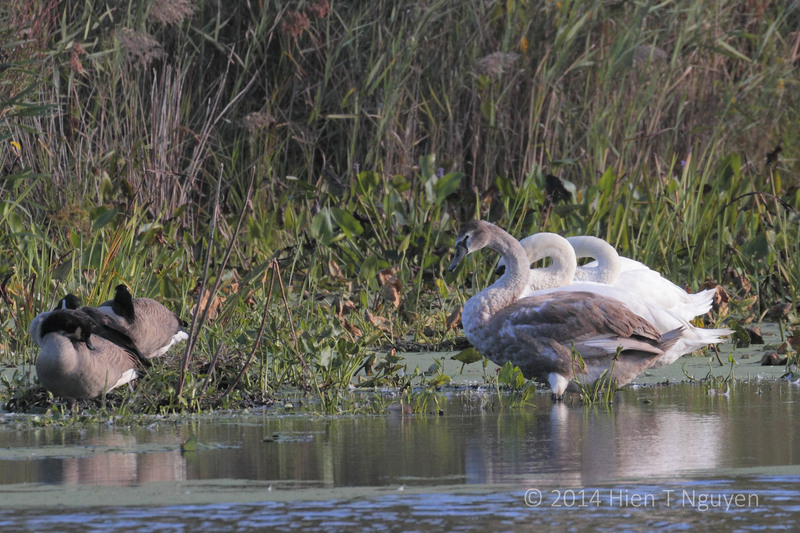 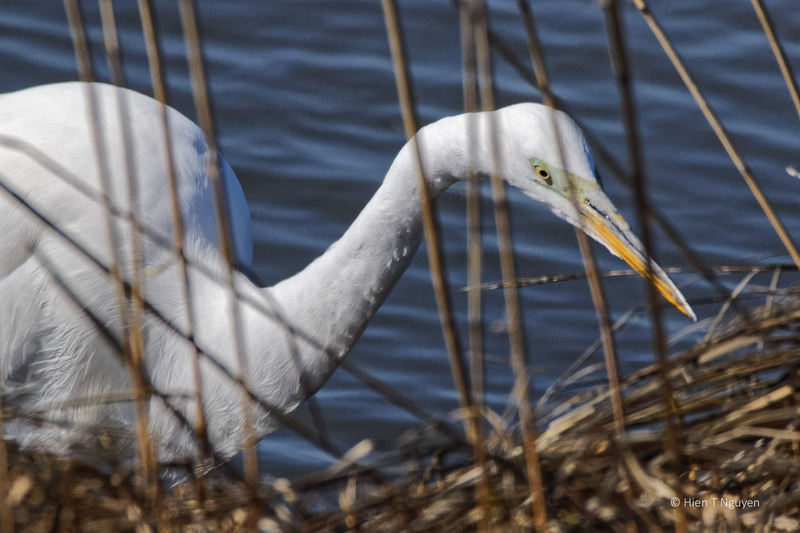 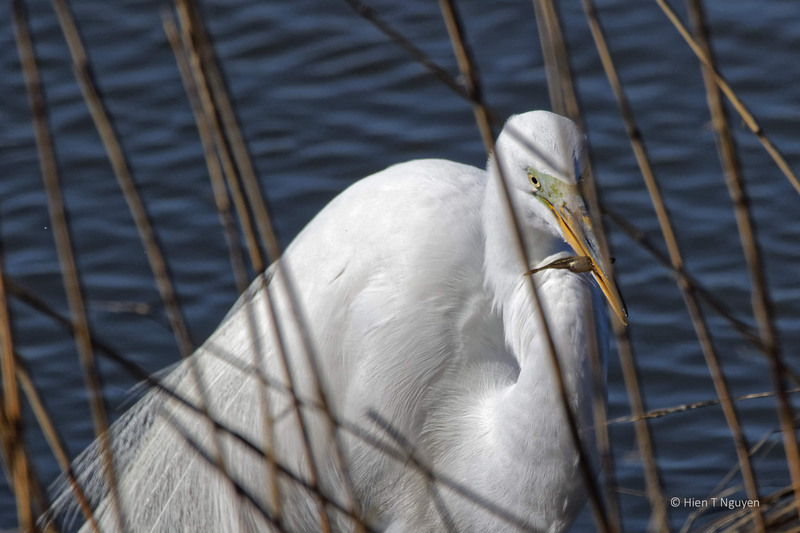 Yesterday, I went to Glades Wildlife Refuge at the southern end of New Jersey not very far from the Delaware Bay. 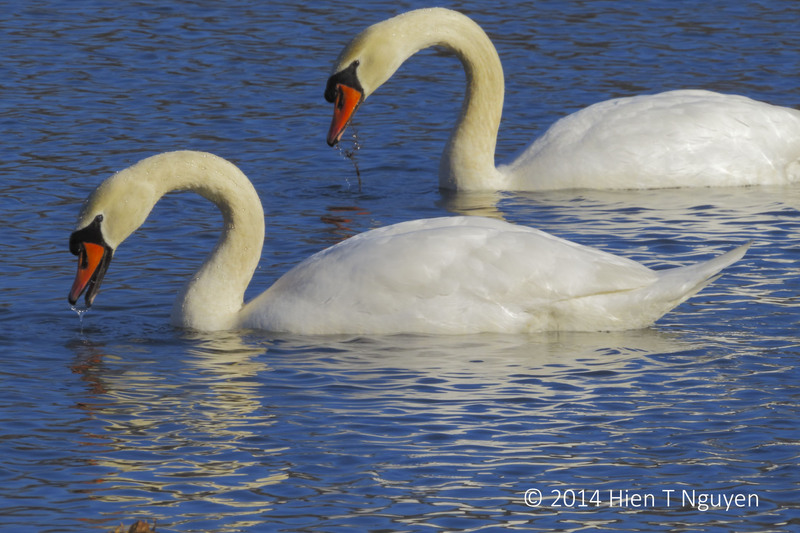 On a pond there, a bevy of Mute Swans was foraging for food, each swan separate from the others, except for a couple. 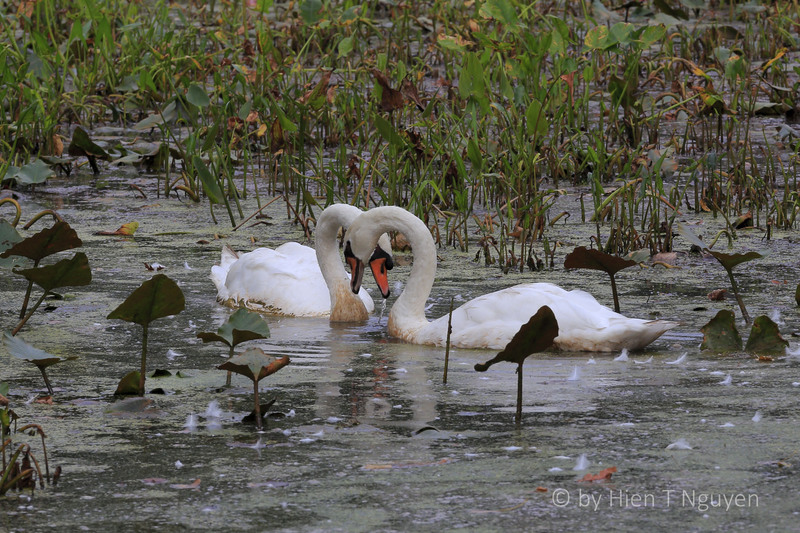 Unless I am mistaken, a smaller female and a younger male where going through courtship rituals. 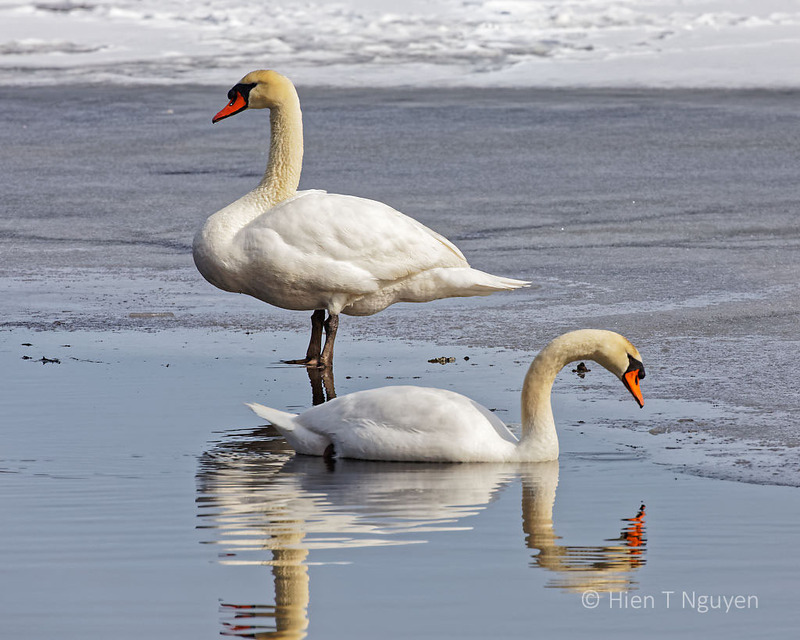 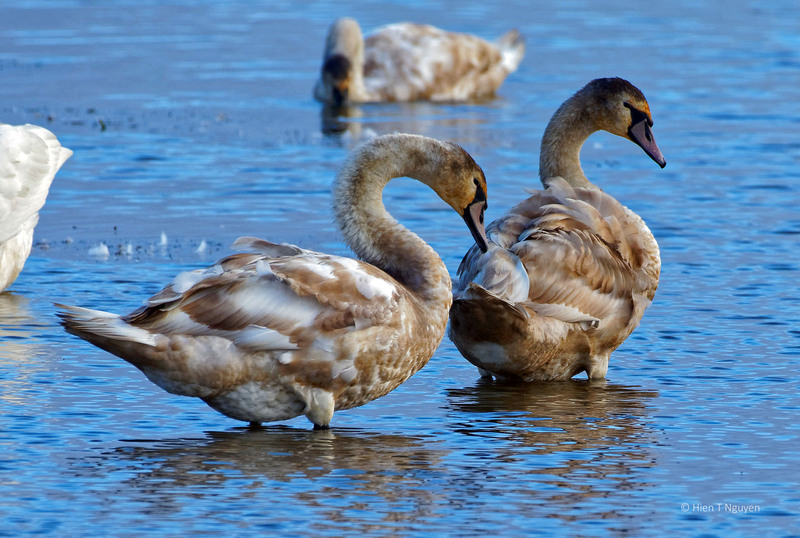 Young male swans have a dull gray bill that will become orange in color when they are mature. 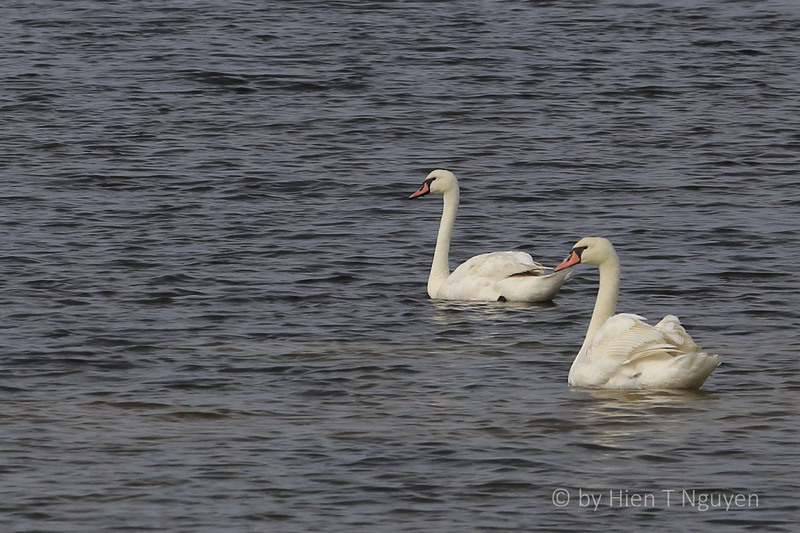 Mute Swans, female on left. 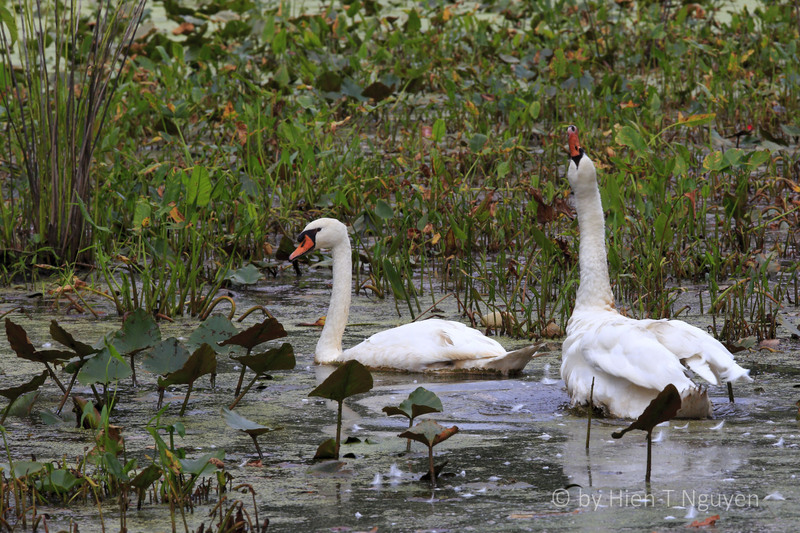 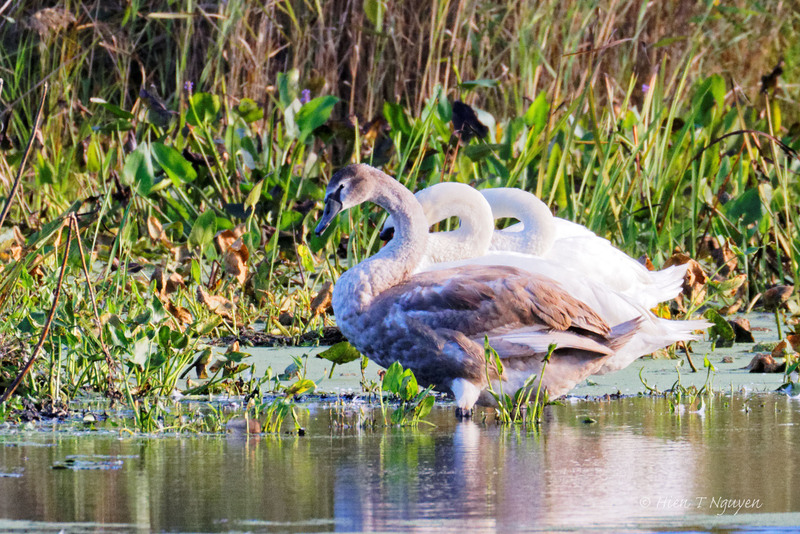 A few weeks ago, the following pair of swans was swimming up and down Spring Lake, which should be renamed Swan Lake, at the Abbott Marshlands. 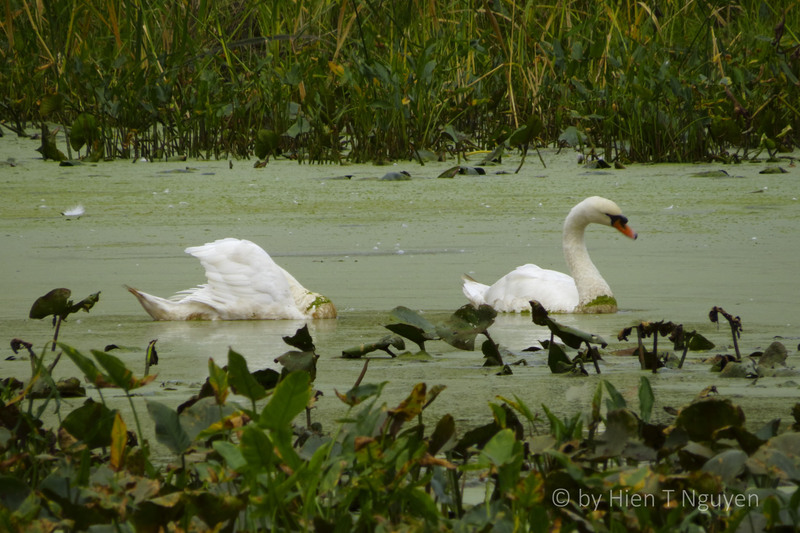 They did not mind my walking along the shore and taking their pictures as they swam gracefully looking for plants to eat. 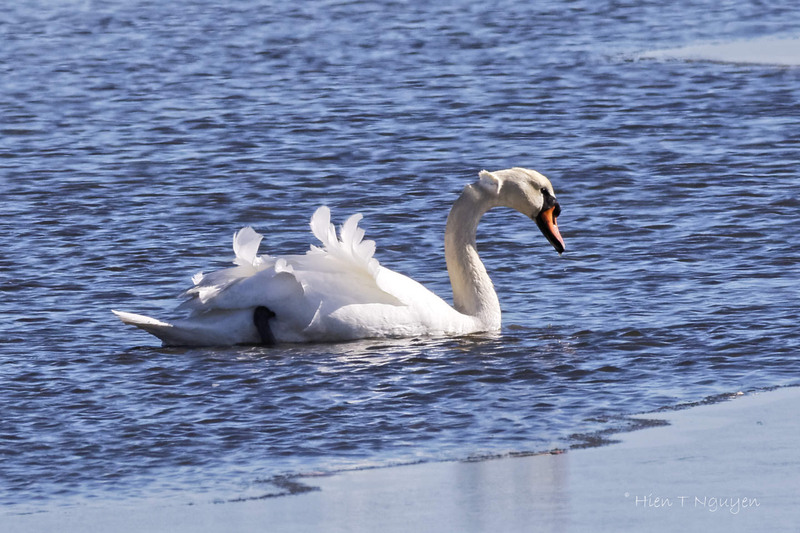 Mute Swan to Mallards: Good day to you! 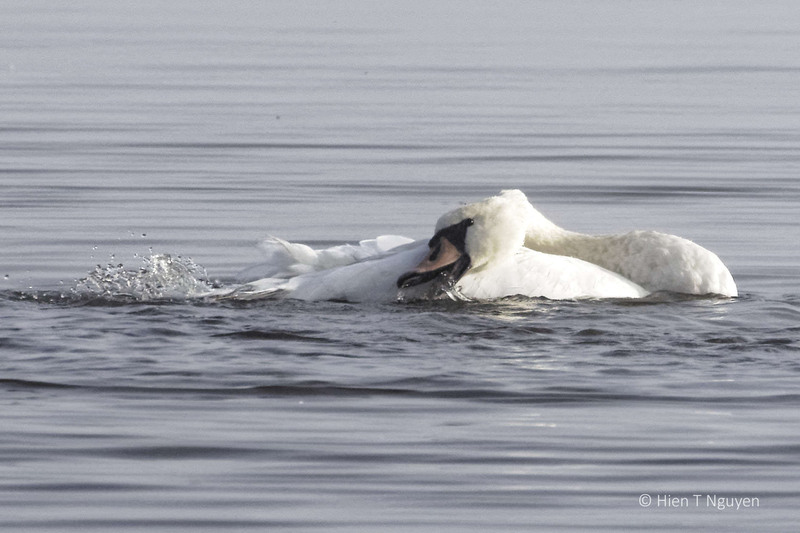 Mute Swan close-up. 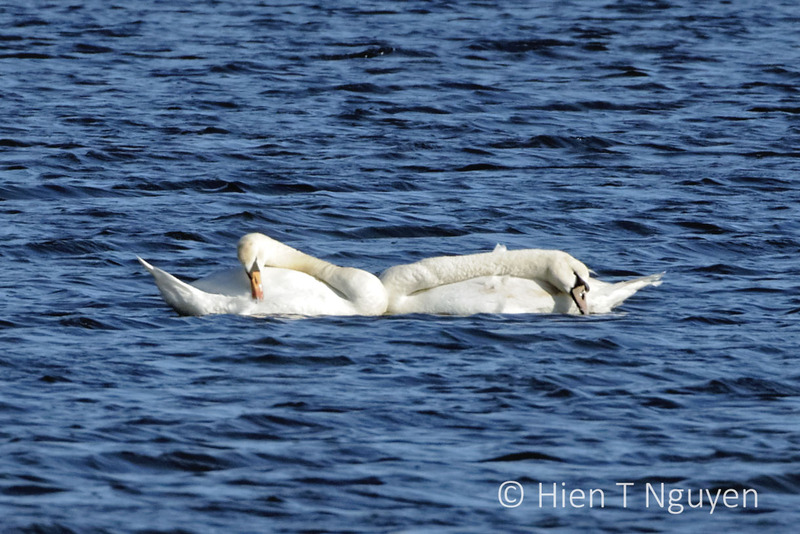 Both swans had a similar size black knob at base of their bill. 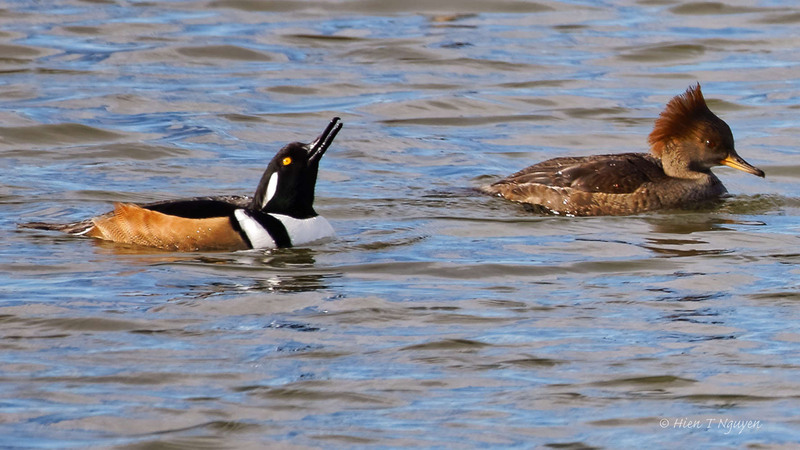 During mating season, the male knob swells in size, but this couple had finished breeding for the year, and I could not tell which one was the male. 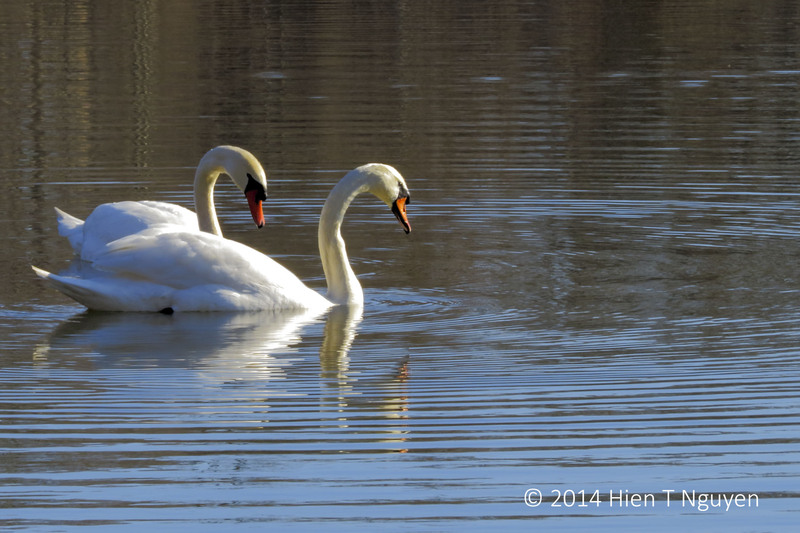 I was told that this pair are permanent residents of the area. 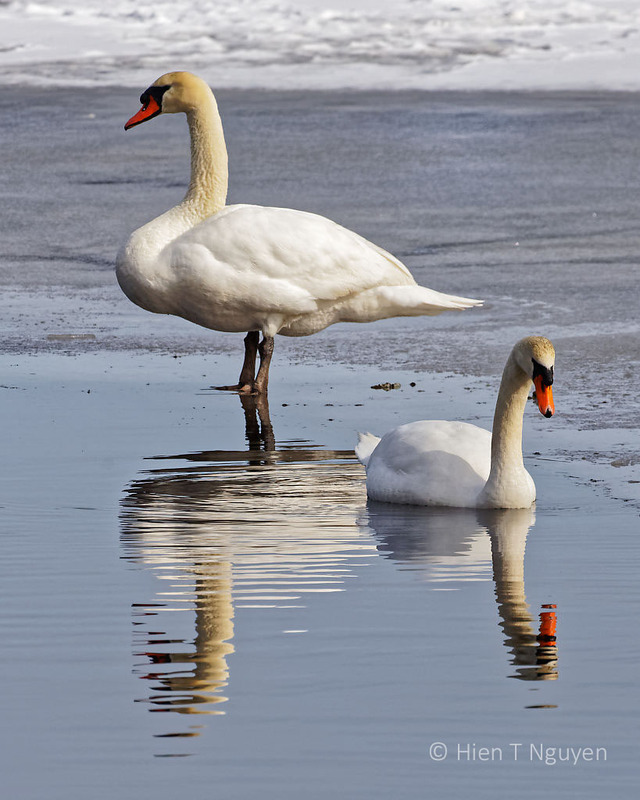 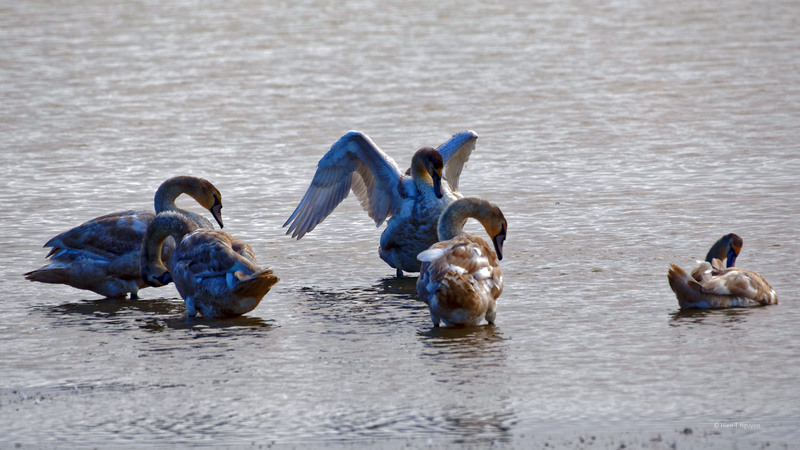 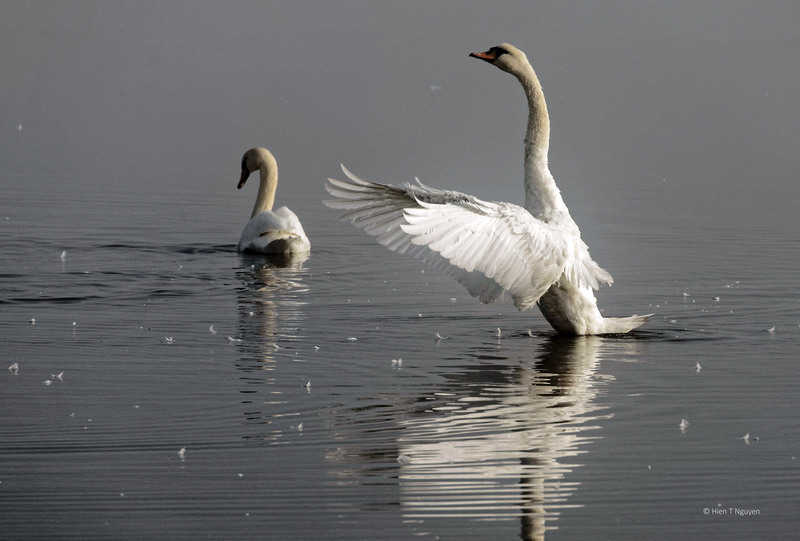 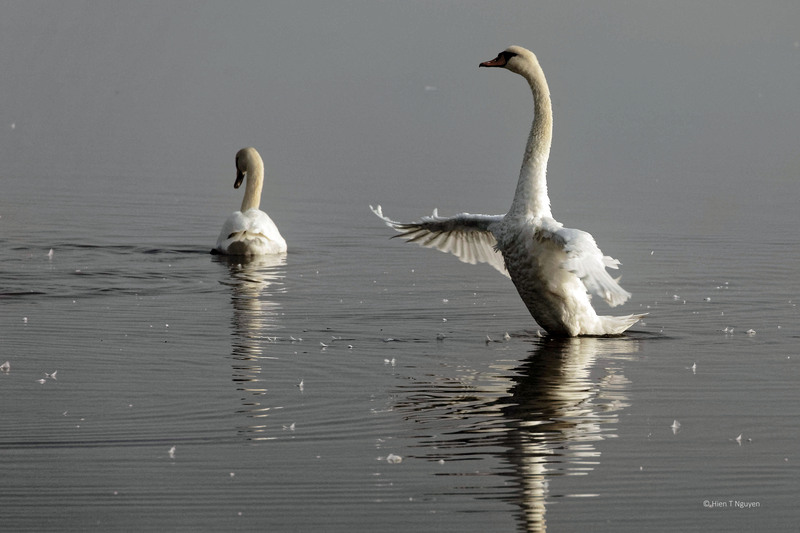 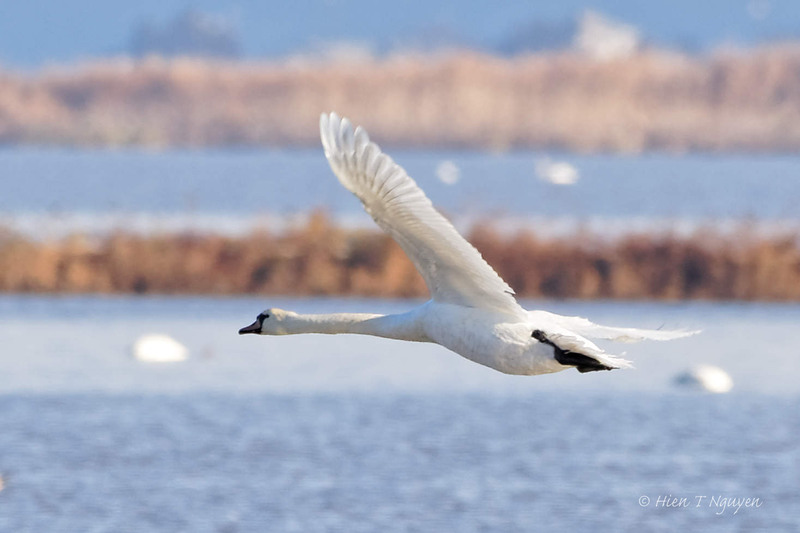 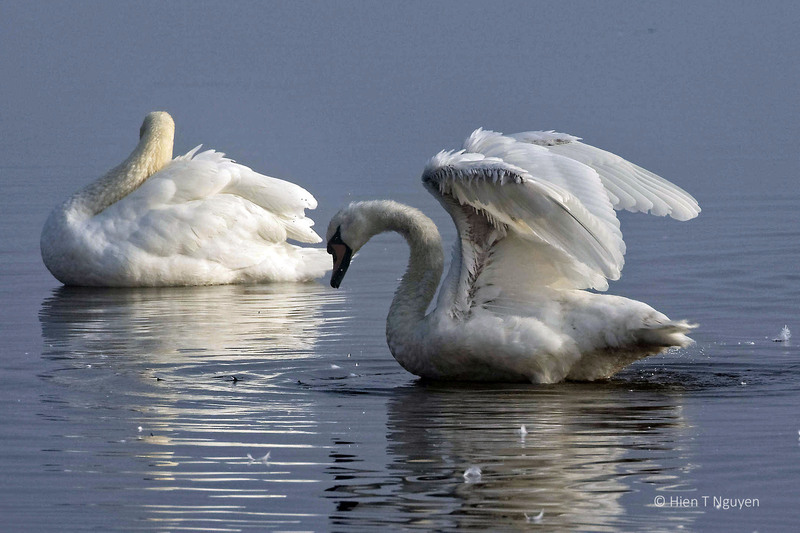 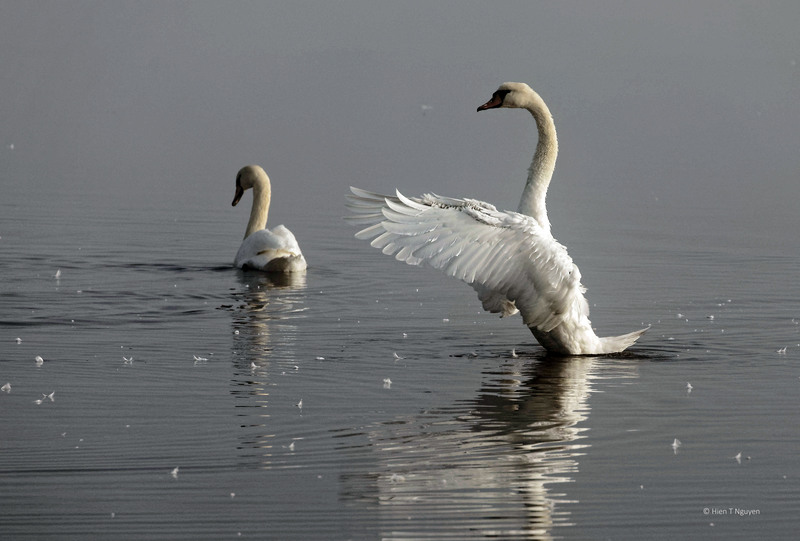 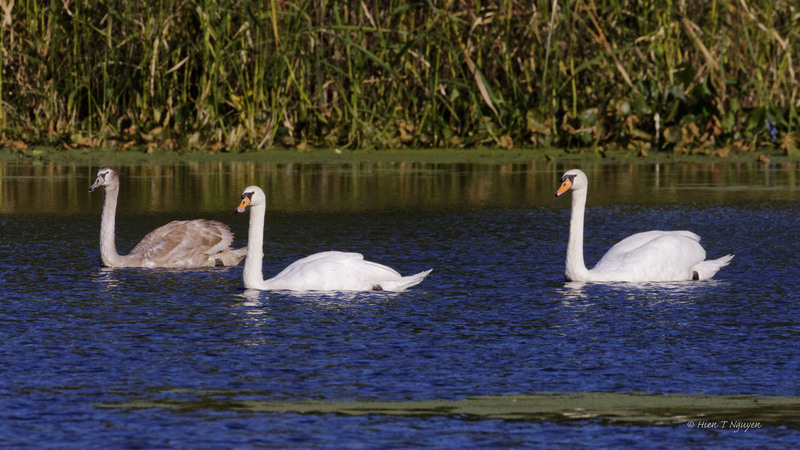 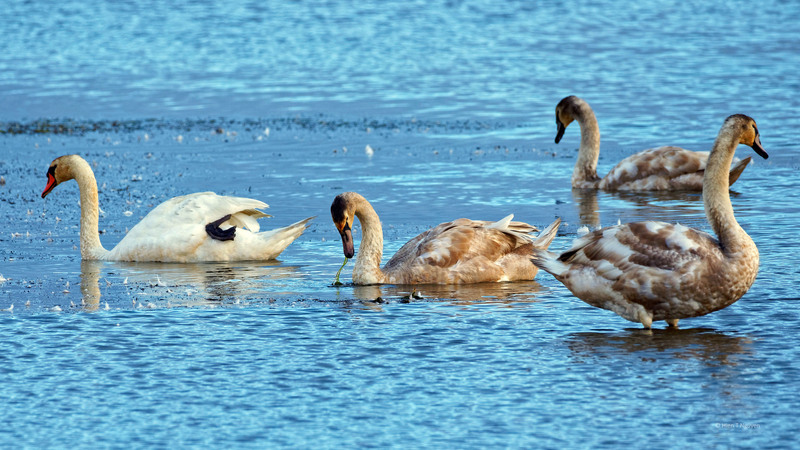 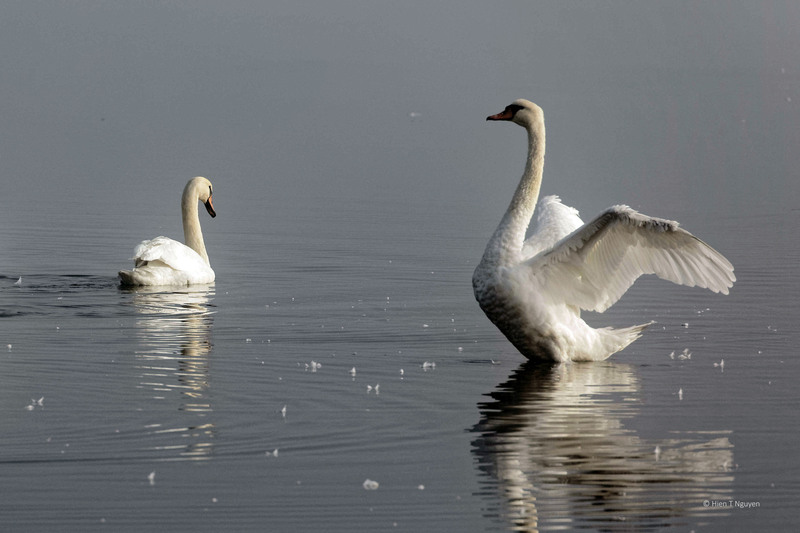 They do not migrate to other places like other swans. 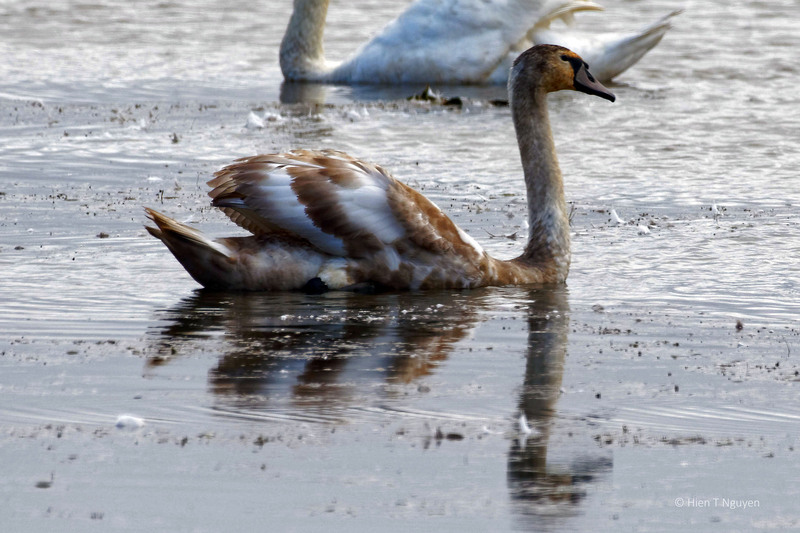 They breed, raise their cygnets and those eventually fly away, unless they are killed by predators.